There has never been an American mind quite like Spalding Gray's. This reissue of his classic 1987 monologue, which recounts his experiences in Southeast Asia while film The Killing Fields, reminds us of his unparalleled brilliance in this form. More than 25 years after its initial release Swimming to Cambodia remains a refreshing and unique cinematic experience. Directed by Jonathan Demme several years before he’d collect an Oscar for Silence of the Lambs the film consists almost entirely of master writer and actor Spalding Gray performing a 90-minute monologue about his experiences in Southeast Asia while filming the 1984 film The Killing Fields. 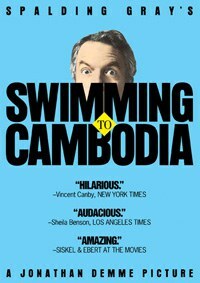 Don’t worry, you’re not the first person to utter a bewildered, “That’s it?” upon reading that synopsis; by all rights Swimming to Cambodia should be about as interesting as re-shelving library books. Gray wasn’t a major draw at the box office in 1987 or even at the time of his death in 2004. When he performed this 90-minute monologue–– cut down from a multi-hour version that’d had been heavily workshopped in New York City––over two rapid-fire days, Gray’s filmography was slender at best and his television résumé even less impressive. For much of the '70s he’d been part of New York’s experimental theatre scene, working with The Performance Group, then co-founding its successor, the Wooster Group. By 1980 he’d begun to establish himself as a gifted monologue artist and it was clear that he possessed an uncommon gift as a writer. He was, in short, an artist rather than an entertainer––and yet he could be wildly entertaining as this film proves. Both his gifts as a writer and an actor serve him well here––and in 1992’s equally compelling Monster in a Box––as he holds us in rapt attention with a microphone, two maps, a notebook, a glass of water and his unbelievable eloquence. Aside from Laurie Anderson’s unobtrusive score and a projection screen with the image of a beach on it, there’s not much else to look at––we’re only given a brief glimpse of The Killing Fields itself. Within that space Gray gives us a wildly funny and frequently touching account of his experiences on the set of that film but also the atrocities that had plagued Cambodia under the Khmer Rouge. This isn’t all a history lesson nor is it an insider’s look at making a major motion picture. Instead, it’s an examination of a brilliant mind and a frequently touching story about one man’s search for meaning and human connection amid the strangeness and tangled complexities of human life. Demme suggests that it’s both a love story and someone “bearing witness to cataclysmic events in history”. In its way Swimming To Cambodia may be one of the most beautiful and eloquent films of its time and Gray, of course, one of the greatest minds the American theatre and, subsequently, the screen, has encountered. He would make three more monologue films in his too-brief lifetime––including the aforementioned Monster in a Box, the Steven Soderbergh-directed Gray’s Anatomy (1996)––and publish a novel, 1992’s Impossible Vacation. His film work picked up in the years after this picture as he appeared in a wide range of features including Beaches, The Paper, Beyond Rangoon and Kate & Leopold, though his monologues and his writing would remain his best and most interesting work. Swimming to Cambodia looks as fresh and immediate today as it did upon its release all those years ago and time has taken nothing away from Gray’s wild, imaginative humor or ability to convey the universal by so beautifully expressing the personal. This new release includes an interview with director Demme who gives us just enough insight to understand how magic this performance really was, and just little enough not to spoil the magic itself.